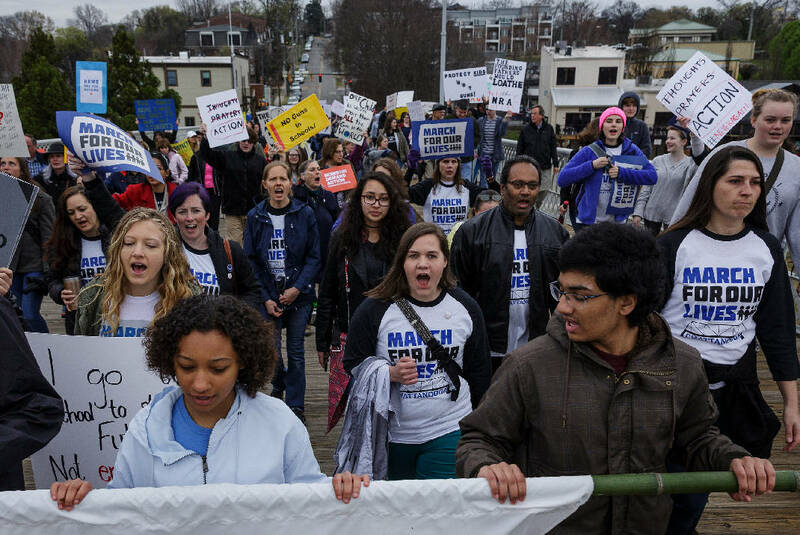 Demonstrators march across the Walnut Street Bridge during the March for Our Lives on Saturday, March 24, 2018, in Chattanooga, Tenn. Thousands of demonstrators marched locally in solidarity with national protests against gun violence spurred by last month's school shooting in Parkland, Fla. The student activists behind Chattanooga's 2018 March for Our Lives and school walkouts calling for an end to gun violence are back. Chattanooga Students Leading Change will host a rally and memorial Saturday in Miller Plaza in honor of the one-year anniversary of the shooting at Marjory Stoneman Douglas High School in Parkland, Florida, that left 17 dead. Eliza Brand, left, and Victoria Woodward, center, cheer during the March for Our Lives in Coolidge Park on Saturday, March 24, 2018, in Chattanooga, Tenn. Thousands of demonstrators marched locally in solidarity with national protests against gun violence spurred by last month's school shooting in Parkland, Fla. The group of middle and high school students from public and private schools around Chattanooga began meeting last year soon after the shooting as teenagers across the country followed the lead of Parkland survivors and expressed outrage over the tragedy. Since last year's March for Our Lives, the local group has traveled to the state Capitol and Washington, D.C., to lobby lawmakers; held a vigil for victims of the deadly Waffle House shooting in Nashville; and partnered with other advocacy groups, including Moms Demand Action, Students Demand Action and Moms for Social Justice. Organizers of Saturday's event said they hope to reignite conversation around school shootings and gun violence. "We kind of want the Chattanooga community to reflect on what has and hasn't happened," said Isabel Harper, a junior at Chattanooga Center for Creative Arts. "That's sort of the pillar of what this event is about." Seo Yoon Yang, a sophomore at Signal Mountain Middle/High School, moved to Chattanooga this year but previously lived in South Florida, about an hour from Parkland. She was excited to join the group because she wanted to find a way to honor the anniversary. "Parkland hit home and it really devastated our community. It was just a tragedy that really affected me and my community," Yang said. "I realized that there was a lot of numbness to gun violence." Many of the student organizers worry that the ups and downs of media coverage of school shootings and the frequency at which mass shootings occur normalize the events and lead to a lack of effort to prevent them. "It shouldn't take another mass shooting to spread awareness," said Molly Barclay, a senior at Chattanooga Center for Creative Arts. 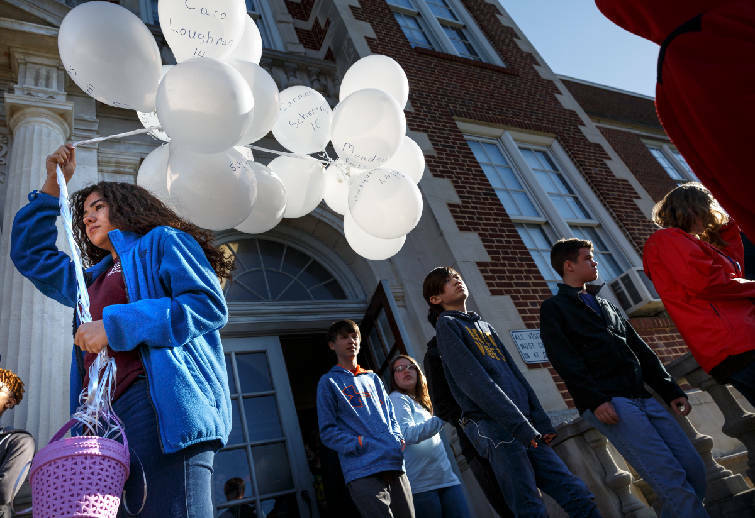 Sophie Albaraket holds 17 balloons in memory of victims of a school shooting in Parkland, Fla., as students walk out of Chattanooga School for the Arts and Sciences in protest on Wednesday, March 14, 2018, in Chattanooga, Tenn. Students across the region and the country walked out of school at 10 a.m. to protest gun violence in the wake of a school shooting in Florida that killed 17. She was echoed by several other students. "The entire point is to prevent it, not to react to it," they said. The students invite all community members, regardless of party line or stance on some of the gun laws the group has lobbied against, to Saturday's event. At its core, they said, the event is a memorial for those lost in Parkland. Community groups and food trucks will be at the event, and there will be voter registration tables and information about how to get involved with organizations fighting gun violence. The Rally of Remembrance for the Parkland 17 is at 10 a.m. on Saturday in Miller Park. For more information, visit facebook.com/events/1955044981471666. Chattanooga middle and high school student members of Chattanooga Students Leading Change meet with Don Johnson of Gov. Bill Haslam&#x573; office on Monday, April 2. 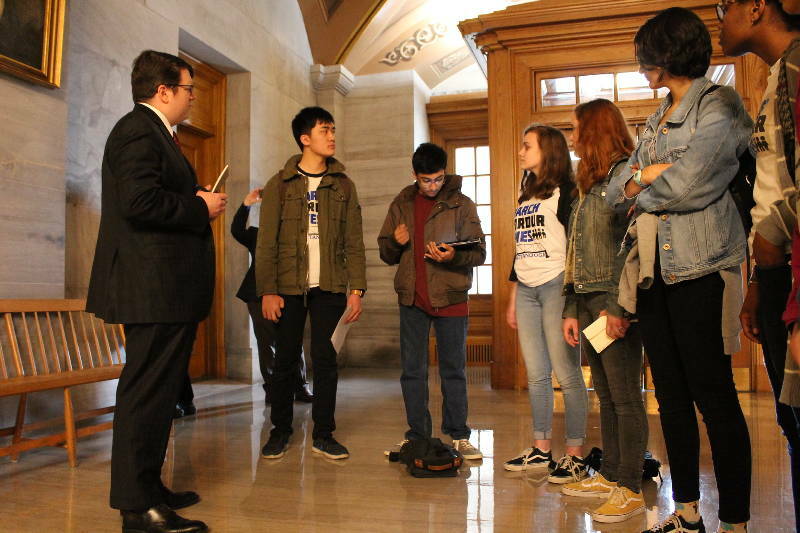 The students traveled to Nashville to lobby the governor to veto HB 2208, which would allow school districts to arm specifically trained staff members on school campuses, if it crosses his desk later this spring. The governor was not available to meet with the students, according to his press secretary.